60 Orange Multivitamin with Omega-3 Softies-Food Supplement. Rich in vitamin D. Vitamin B5: mental performance. Delicious orange flavour. Contains 8 essential vitamins. Food Supplement We all want our little ones to shine in life! 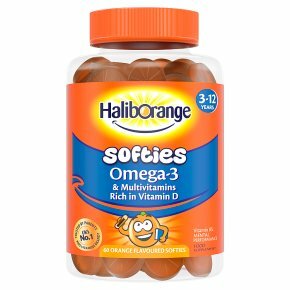 Haliborange Multivitamin & Omega-3 Softies are a tasty way for your child to get some essential vitamins they need every day. Flaxseed Oil: A source of essential omega-3 (ALA) fatty acids. Vitamin A: Helps support normal vision. Vitamin C: Helps support the immune system. Vitamin B5: Contributes to normal mental performance. Food supplements are intended to supplement the diet and should not be regarded as a substitute for a varied diet and a healthy lifestyle.<br><br>KEEP OUT OF REACH OF YOUNG CHILDREN.<br>CHECK SEAL IS INTACT BEFORE PURCHASE.<br>REPLACE LID SECURELY.